A beautiful woman sits down at a poker table and Poker Boy knows instantly everything feels wrong. She seems beautiful, but her appearance hides something far more sinister. 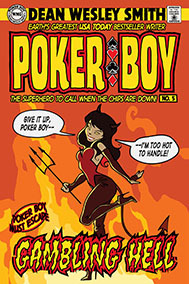 Poker Boy, in a fair hand of cards, finds himself in a fight to save an entire table of innocent card players from ending up playing a very, very long and losing game in the poker room in hell.